If you run over a sharp object, a flat tire is inevitable. A deflated tire can be dangerous, especially at night in a deserted area. Instead of waiting for AAA or a Good Samaritan, keep this Car Tire Plug Set in your trunk to repair the tire quickly. The kit is on sale for 50% in the Daily Caller shop. 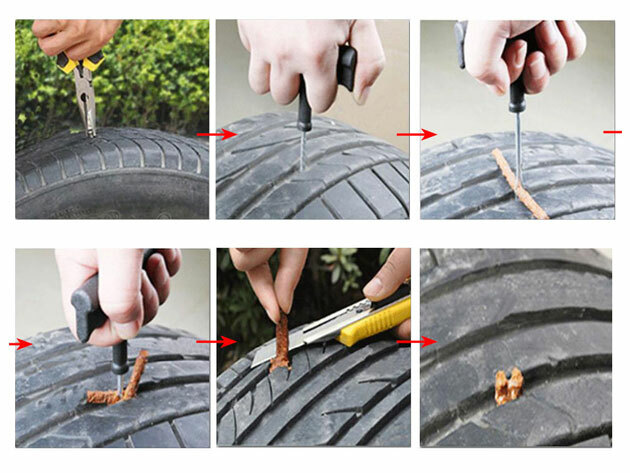 The Car Tire Plug Set includes a rasp tool, split eye inserting needle, rubber cement, and three different tire repair strings. These supplies allow you to plug your tire long enough to reach a mechanic. Using this method will prevent permanent change to your axle. At $9.99, the set is affordable enough to keep in your car and gift another to a loved one. Fix your flat tire quickly with the Car Tire Plug Set in the Daily Caller shop, on sale for $9.99.